Copies of the informational sessions Charting a New Course are now available on DVD at the Bridgewater Public Library for circulation and viewing. The first video entitled Professionalizing Bridgewater's Government can be obtained there now! All are welcome to the 3rd Annual Buckley Band Reunion to help raise funds for the Bridgewater Girls Basketball program. This fundraiser will support youth league basketball for Bridgewater girls in both the recreational league and the travel teams. Bridgewater, MA - First Parish Unitarian Universalist Church, 50 School St., Bridgewater, MA will host an Empty Bowls Soup Dinner on Saturday, March 13, serving from 6:00pm – 7:30pm. Admission is $10 and includes a hand-painted bowl, soup, bread and a beverage. There will be raffle tickets sold for a variety of prizes, and from 6:30pm – 8:30pm there will be musical entertainment. All proceeds will go to the Bridgewater Food Pantry and the church’s MainSpring House Lunch Fund. Empty Bowls is a grassroots effort to raise money and awareness in an effort to end hunger and food insecurity. Each group that participates in the Empty Bowls project works with their community to create their own event. First Parish U.U. Church wanted to incorporate the arts in their hunger relief project. The church invited the community to help paint 100 soup bowls at three painting parties held in February. The bowls will be sold at the dinner event. They will serve as reminders to guests that on this one occasion they chose to do something to alleviate hunger in their community, and they could chose to do so again at any time. Please call Ellen Bordman, Director of Religious Education, at 508-697-2525 for more information. The appointing authority would be either the Board of Selectman (BoS) or the Town Council (TC), who would have the authority to hire and fire the town manager. The Town Manager's duties are the same under each charter. The major difference is that under the Open Town Meeting / Board of Selectman Charter, the town manager shares executive authority with the Board of Selectman, whereas under the Town Council Charter, the Town Council acts as the Legislative Branch and the Town Manager is the single chief administrative officer. The town manager is responsible for conducting the daily affairs of the town. The town manager appoints all department heads with the ratification of the Board of Selectman or Town Council. The Town Manager also has the authority to fire the department heads he or she appoints. In other words, the Town Manager is given the authority to build his or her team, and part of the Town Manager's evaluation each year is based on how well they have built their team and how well that team functions. Note: the TM does not hire the individuals within departments; that authority is vested with each department head. The Town Manager appoints all members to boards and committees. However, the Town Manager is required to form a citizens' advisory group to help recruit and evaluate potential members to the boards and committees. The Town Manager is also required to develop and publish written criteria for membership to the boards. The Town Manager is required to submit recommendations to the Board of Selectman or Town Council for ratification. The Town Manager coordinates the activities of all departments and boards to ensure that the policies of the Board of Selectman or Town Council are adhered to. The Town Manager also recommends policy to the BoS/TC for their action, and once policy is made, carries it out. The Town Manager is there to help the department heads execute their duties and keep the BoS/TC informed as to what the department heads need to do their jobs. The Town Manager is responsible for putting a financial team in place, preparing and submitting the annual budget by working with the department heads, financing committee, and the financial team. The Town Manager is responsible for developing recommendations for an employee compensation plan as well as personnel policies, contract negotiations, long range financial and capital planning. The Town Manager will also develop a system to preserve and publish financial information, so as to make government as transparent as possible. In essence, the Town Manager is a facilitator, a coordinator, a leader, and a person with vision and ideas to make the town a better place for all. He or she is a professional who has clearly defined responsibilities and authority, and is held accountable through an annual evaluation process. He or she operates within a system of checks and balances and works to promote what is in the best interest of the residents of the town. 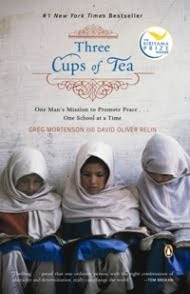 Please join us in reading "Three Cups of Tea," by Greg Mortenson. The book recounts the journey that led Mortenson from a failed 1993 attempt to climb Pakistan's K2, the world's second highest mountain, to successfully establishing schools in some of the most remote regions of Afghanistan and Pakistan. By replacing guns with pencils, rhetoric with reading, Mortenson combines his unique background with his intimate knowledge of the developing world to promote peace with books, not bombs, and successfully bring education and hope to remote communities in Central Asia. OBOC Book Club meetings will be held on March 1st, March 15th and March 29th 2010, from 11:30am-12:30pm in the CART Conference Room 221, in the Moakley Center. Please bring your own lunch. The book club is open to all BSC employees and the Bridgewater community. If you are interested in joining us for a series of three discussions please contact the Office of College and Community Partnerships to pick up a copy of the book. For more information about One Book One Community and related events and to learn more about Greg Mortenson please click here. The first in our series of three Tea-vents! James Hayes-Bohanan will talk about tea, its origins and traditions and how it relates to the book “Three Cups or Tea” by Greg Mortenson the One Book One Community book choice for Spring 2010. Please join us for conversation, tea and goodies! Bring your favorite tea cup! Door Prize: Tea cup flower arrangement by Bridgewater Florist. The Bridgewater Improvement Association will hold a meeting on March 4th at 7:00 p.m. at the Senior Center. The meeting is open to members and anyone else who's interested in learning more about the two town government charter options that will be on the April 24th ballot. Please feel free to come and bring your friends and neighbors and your questions. The Bridgewater Garden Club will hold their evening meeting on Monday, February 22nd at 7 p.m. at the Cole Yeaton Senior Center on Wally Kreuger Way. Dr. James Hayes-Bohannon, a professor at Bridgewater State College, will present a program on "Cultivating Coffee Quality." The presentation will be on the cultivation and production of coffee and how it affects the people who grow it. There will also be a daytime meeting on Wednesday, February 24th at 1 p.m. at the Cole Yeaton Senior Center. Ginny Ballou will host a discussion/demonstation on tips, tricks, and tools for "Garden Inspirations." The public is invited to both events. For more info call 508-697-7827. Sporadic Evolution Theatre is proud to announce its upcoming production of "Sondheim In 60:", A Musical Revue. The show serves as a pre-cursor to their May production of Stephen Sondheim's murder-mystery thriller, "Sweeney Todd". Please come join Sporadic Evolution Theatre for this special evening as they showcase Sondheim's work as both a lyricist & composer on such musicals as "Company", "Sunday In The Park With George", "Into The Woods", "The Frogs", "Sweeney Todd" & many others. The show will take place on February 26 & 27@ 8pm @ the newly renovated Eldon T. Cole Parish House, 15 Cedar St., Bridgewater, 02324. Tickets are $15 general admission & can either be purchased @ the door or reserved by call 508-532-2738. Here is the agenda for this week's Board of Selectmen meeting scheduled for 02/16/10 beginning at 6:30 PM. Meeting Adjourns and Relocates to BTV Studios at 80 Spring Street. Next portion begins at 7:30 PM. This column, Charting a New Course, is designed to provide information about the charters to Bridgewater residents who will vote April 24th as to the form of government they prefer. This column will address various aspects of the charters each week. Residents are encouraged to submit questions and comments by emailing the Town Government Study Committee at: TownGovernmentStudy@bridgewaterma.org. Questions and comments will be answered directly or in a subsequent column. A program by the same name will also air on BTV starting February 7th. Bridgewater’s 54 original settlers in1650 governed themselves by following a loose set of by-laws that were adopted and changed throughout the years. All residents were required to attend Town Meeting under the threat of being fined if they didn’t. Bridgewater, unlike many towns, instead of charting it’s own course eventually relied on state laws and local by-laws to govern itself. This worked when the population was small and the needs less complex. Simply stated, a charter is a constitution for Bridgewater. The proposed charters are simply a codification of how the town will govern itself in the future. Approval by the state legislature is required to ensure charters conform to state law. Bridgewater’s charters are in the process of being approved by the legislature and residents will vote Yes or No on either charter in April. What will a charter do for Bridgewater? · outlines the specific rights of citizens to put forth initiatives and petitions, and more that will be addressed in future articles. Suffice to say the charters are a road map as to how the town must conduct its business. How were out charters written? · consulted with state experts on charters. The proposed charters reflect the combined wisdom of those individuals and organizations involved in charter development and managing a town under a charter. The best practices reflected in the charters are those modern practices of management that towns should be using to govern even if they don’t have a charter. Both charters professionalize the management of the town by putting a town manager in place who has the education, experience, and the skill set to manage the operations of a complex $40 million dollar business like Bridgewater. It holds one individual accountable for implementing the policies that are made by the elected Board of Selectman/Town Council and removes the day-to-day management of the daily business of the town from those elected entities. It should also be noted that a charter is a “Living and Breathing Document”, created through a collective, consensus driven process and as such it will never be “Perfect” in everyone’s eyes. Therefore it is mandatory that the charter be reviewed every six years for potential updates. It can also be changed sooner through an amendment process, with input from the citizens of Bridgewater. Next column will address the town manager, responsibilities and authority. Around the Common and Off the Common Coffeehouse seems like a good match. Check out their website below for some great live music right here in Bridgewater! On February 10th the Bridgewater Public Library will raffle off two tickets to the Harry Potter Exhibit at the Museum of Science in Boston. This special exhibit runs through February 21st. This free raffle is open to library patrons aged 18 and under. Your raffle ticket may be picked up at the Children's Room Desk or the Information Desk. The library owns multiple copies of all the Harry Potter books including some in large print, Braille and in audio format. On February 8, 2010 at 7 p.m. the American Cancer Society Relay For Life of Bridgewater, Lakeville and Middleboro will officially get underway as event volunteers and participants gather at St. Basil's Chapel, on the Bridgewater State College campus, for a kickoff rally to launch their fundraising efforts for the year. The rally will feature speakers from the community who have benefitted from the funds raised at Relay and will honor cancer survivors. This will also be the first opportunity to register a team and select a campsite for the overnight event to be held on June 18-19 at Bridgewater Raynham High School.